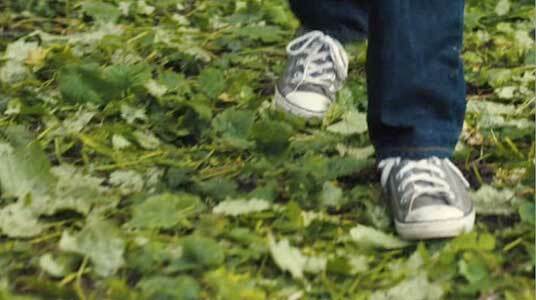 Zane Austin wears gray and black low top Converse “Chuck Taylor” All Stars in the film. 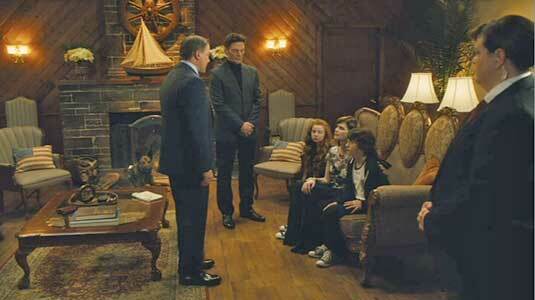 Francesca Capaldi wears black low top Converse “Chuck Taylor” All Stars in the film. TJ meets Max at the White House. TJ Bennett (Zane Austin) is an unhappy twelve-year-old. His parents (Lochlyn Munro and Carrie Genzel) are the newly elected President and First Lady of the United States and now his every move is watched by the Secret Service and the public when TJ is not in the private quarters of the White House. All TJ wants to do is live a normal life and be with friends, something that is now not possible. Then into his life comes Max, on loan from the military while Butch, the regular Secret Service dog is having a litter of puppies. Max and TJ instantly bond, and now TJ has a companion that makes things less awkward at school and at the White House. TJ with his parents, President and First Lady Bennett. After making a friend at school, TJ is invited to a party. Excitedly he asks his parents for permission to attend, but is shot down. The Russian president (Andrew Kavadas) is arriving for a for a state visit and formal dinner along with his young daughter Alex (Francesca Capaldi) who is TJ’s age, and TJ is expected to be at the dinner, dressed up in a nice suit. The two meet and get along awkwardly at first. Eventually they are excused from the formal state dinner, and go to TJ’s room where their relationship starts to warm up and they both complain about how little freedom they have to do what they want. On a dare, the two sneak out of the White House by climbing down some scaffolding and eluding the Secret Service men who are watching outside TJ’s room. Once out of the private quarters, they hook up with a tour group leaving the White House and exit the grounds. The timeline is a little shaky here. You would think that the state dinner was at night, but why would there be a tour group at night while a formal event is on? And the group is shown leaving by daylight. Then when TJ and Alex are by themselves, it is night as we see them walking down the streets of Washington, DC on their way to the party TJ had been invited to attend. The Secret Service and Max escorting TJ to school. Predictably, things go wrong as a van roars up beside TJ and Alex with masked terrorists inside who attempt to kidnap them. Luckily Max has heard them leaving and is able to follow them off the White House grounds. He attacks the kidnappers and TJ and Alex are able to escape. 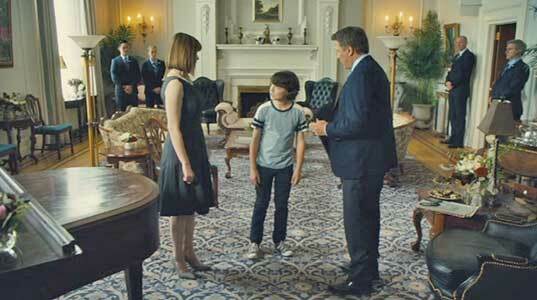 We are not quite sure how this is resolved, as the next scene shows them back at the White House being lectured by their parents. But this kind of action continues, as several conspirators placed within the White House staff and the security staff of President Bragov continue to plot against the two families and the hopes that they will come to a new peace accord that has been in the works. Similar mix ups and misunderstandings occur, but where the humans fail, Max is there to make things right when there are attempts to harm the First Lady, lock TJ in a kitchen freezer room, and kidnap Alex again. Not a good time to be in the Secret Service unless you are a dog. TJ befriends Alex, the daughter of Russian President Bragov. The producers of Max 2: White House Hero definitely suffered from some bad luck with this screenplay. As this review is being written, and the film is in scheduled release, a special prosecutor has been empowered to investigate Russian interference in the 2016 elections and charges of influence peddling in the White House. This attempt to make a family friendly story about sit-com relations between the Americans and Russians really does fall flat in this context. Plus the characterizations are pretty much stereotypes and the plot is mostly unbelievable. There have been several movies like this before involving the children of major political leaders getting involved in adventures, and none of them really ring true. If you are willing to leave your brain at the door, then you can enjoy this film as a “boy and his dog save the day again” type of story. 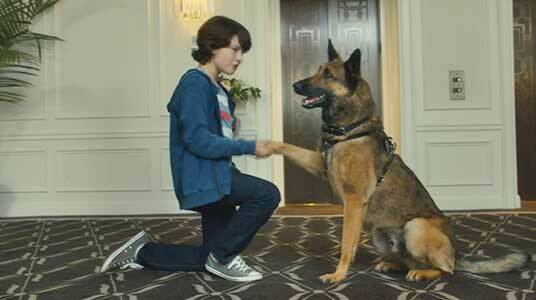 The dog stunts are the best part of the film. A lot more interesting type of film could have been made if the producers hadn’t tried pushing their franchise too far. It is a pretty big stretch taking Max, a PTSD dog recovering from service in Afghanistan to the White House as protector of a fictional first family. The two first families in a heated discussion. Close up of TJ’s grey chucks. Zane Austin in his role as TJ Bennett wears grey low cut chucks throughout the film. At least it seems like he does. All the clothing he wears is kind of cheap looking and it wouldn’t be surprising if he was wearing chucks knock-offs to go with the general thrift store look of his costuming. While TJ was supposed to be an everyman type of kid, not at all impressed or comfortable with his new status, he still is the son of affluent parents. Come on, costume design, doesn’t this kid at least deserve first line athletic wear, and a brand new pair of chucks like other kids would demand from their parents? Especially knowing that he is going to be in the public eye all the time. Francesca Capaldi does appear in black chucks in a few scenes toward the end of the film. TJ discovers an important clue when he drops his ice cream on the floor. Max 2: White House Hero. (2017) Zane Austin, Francesca Capaldi, Lochlyn Munro, Andrew Kavadas, Reese Alexander, Carrie Genzel, Bradley Stryker, Kathryn Kirkpatrick, Bruce Blain. Directed by Brian Levant. Categories: Adventure, Family.